Pikmin is a real time strategy game, a very unique and quirky real time strategy game. It is the first game in the series and it was created and produced by Shigeru Miyamoto in 2001 for the Nintendo GameCube. In 2008 a Nintendo Wii version of Pikmin was released with updated controls using the Wiimote. Both versions are mostly the same besides the different in controller, AI is a little smarter, you can load your game from the previous day on the Wii version and the Wii version also is displayed in widescreen. The story however is the same in both. Captain Olimar is flying in outer space while on his way to a well deserved vacation. When all of a sudden a comet hits his ship the S. S. Dolphin and he is pull into the atmosphere of the planet below. Now trapped Olimar has 30 days before life support systems shuts down. He must recover the important pieces of the ship and escape the planet before the before time runs out. 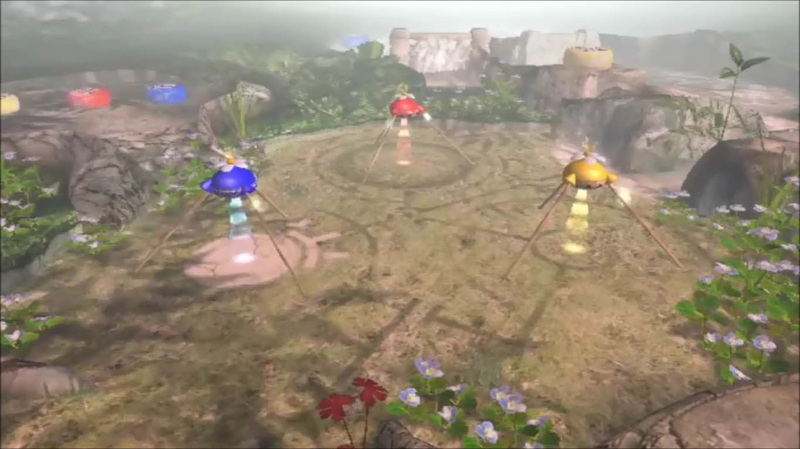 Pikmin was almost lost to the “Land of Forgotten Great Games” because it was a GameCube exclusive title at first. Olimar can’t find and transport all the parts to his ship on his own. Luckily these little creatures called Pikmin are happy to help. There is a Red Pikmin they are fire proof, Yellow Pikmin can find and use bombs and Blue Pikmin are the only ones that can go into the water without drowning. You can use all of them in combat but certain Pikmin are meant for certain areas. There are also several boss battles in each of the five sections that will take time to figure out. Plus, you must use your Pikmin to figure out puzzles, destroy walls and create more Pikmin of course. Pikmin took us 12 to 15 hours to get through the game the first time. We failed to find enough parts to escape the planet on our first try and got one of the bad endings. It took some time to figure out how to destroy some of the bosses and find and get back all of the pieces to the ship and that is a good thing. Replay is pretty good, we did finally find everything and did everything and would play it all over again. No real control problems and the camera works well too, it has several camera angles to choose from. It is worth buy $35.00 of less for. We loved it and if you find it under $20.00, MUST BUY PRICE!